When cold weather hits,home pest control in Frisco, TX consists mostly of swatting at random flies and crushing spiders, because many of the bugs and other pests we deal with for the 8 or 9 warm months of the year die or go into hibernation. There are some exceptions to this, of course. Indoor pests like rodents, spiders, bed bugs and termites continue with business-as-usual throughout the winter because most of their business takes place inside our homes, where it’s warm and cozy. Outdoor pests like mosquitoes, fleas, bees and wasps are particularly susceptible to frigid weather and don’t require many days of freezing temperatures to disappear or slow down considerably. And then there are fire ants. 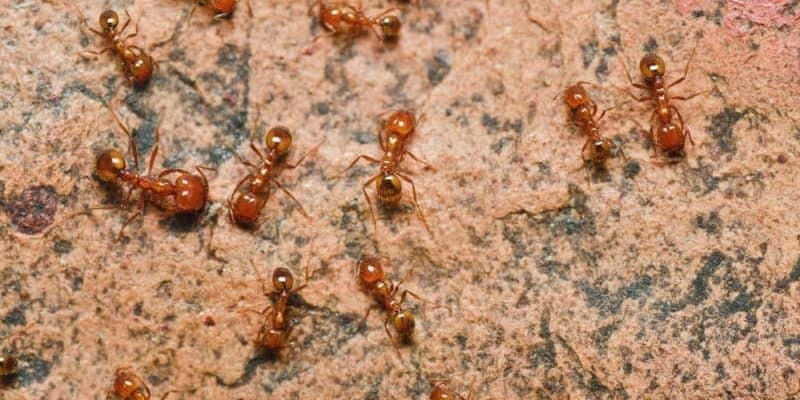 It’s estimated that there are over 150,000 fire ants for each person in the United States and that a typical mound has between 250,000 and 500,000 fire ants living in it. What do those numbers mean. They mean that we’ll probably lose a lot more of our battles with fire ants than we win. 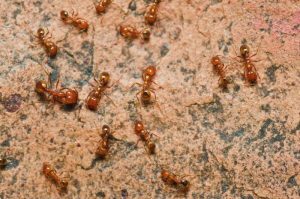 Fire ants just keep going, no matter what the weather is like, and our puny human attempts at home pest control in Frisco, TX are generally useless. Gasoline, bleach, hot water and expensive baits may take out one mound, but fire ants just regroup and dig a new tunnel in another direction, where they’ll pop up with a new mound. Though fire ants can and do survive cold weather, they are more vulnerable in the winter for a couple of reasons. Because they’re foraging for food more actively, they are more likely to take poison baits back into their mounds. Additionally, mounds are generally weaker during these colder months because the breeders that left in the spring to start new mounds decreased the number of ants in the old mounds. When there are fewer ants, it’s harder for them to quickly dig new and deeper tunnels when they’re threatened. At Safe Pro Pest Control, our technicians have the training and products to treat and eliminate fire ants in the winter and all year round. We know that home pest control in Frisco, TX is an ongoing battle that can only be won by keeping pest numbers low with regular inspections and treatments, so call Safe Pro Pest Control at (972) 435-0700 to schedule an appointment. Visit us online at www.safepropest.com to find out about our full range of services.